A Google Web Search Help forum has several tablet users upset that they are being forced into a smartphone enabled mobile interface on their tablet devices. 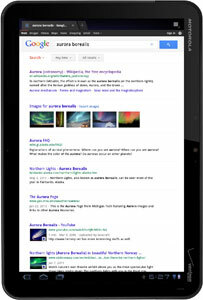 They want the full user experience, not a smaller mobile experience when using Google services on their tablets. Jacqueline from Google has been addressing tablet users concerns one by one. At first the webOS HP Touchpad had issues being forced into the mobile version, that issue was resolved. Then other tablet users complained. Jacqueline said they fixed most of the issues but asked users if they are still seeing issues. We made some changes for this a few days ago - are you still having trouble?